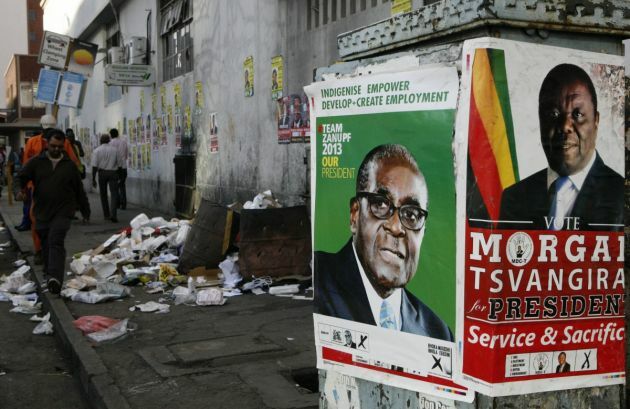 (Photo: REUTERS / Philimon Bulawayo)Election campaign posters are pictured near Zimbabweans walking on a street blocked by uncollected garbage in Harare July 17, 2013. President Robert Mugabe's rivals said on Wednesday the chaotic organisation of early voting for soldiers and police showed Zimbabwe was not ready for a July 31 general election in which more than six million people are registered to vote. Mugabe's main rival, Prime Minister Morgan Tsvangirai, told a rally that the long queues seen during two days of special voting for 70,000 police officers and soldiers clearly showed the Zimbabwe Electoral Commission (ZEC) was ill-prepared. Zimbabwean President Robert Mugabe does not like losing elections. The 89-year-old president has ruled his country for 33 years. His opponents say he stole all the southern African nation's 21st century elections and that he may repeat his actions week. "Mugabe stole an election in 2002, he stole the election in 2008. This time we want to tell him that he will not steal again," his opponent Morgan Tsvangirai said to thousands of supporters in Chinhoyi, 100 kilometers northwest of the capital on Sunday. "As a party we don't have intentions of retribution. What we only want and what we are saying is: 'Mr Mugabe run this election freely and fairly so that we can give you a dignified exit.'" Zimbabweans will vote on Wednesday for the first time since the violence-marred election in 2008. Mugabe leads the Zimbabwe African National Union Patriotic Front (ZANU-PF), against Tsvangirai's Movement for Democratic Change (MDC). Church leaders in Zimbabwe have asked Christians around the world to pray for their country, and called for there to be no violence ahead of the July 31 elections as in the two past elections. Some human rights groups and Mugabe's opponents say that Mugabe's party along with the military and the police are intimidating through arrests and targeted violence and that they are adding names to the voter list. In the eastern city of Mutare, in front of thousands of supporters, Mugabe likened Tsvangirai to "a coward like my Uncle Shoniwa's dog, Sekahurema, which used to run away from game when we were hunting." Mugabe added, "That stupid dog died without killing a single prey, and the same will happen to Tsvangirai." The Zimbabwean Council of Churches (ZCC) wrote an open letter requesting that political leaders avoid the bloodshed which marred elections in 2008. "Men and women of faith should play a positive role in maintaining sanity in all political processes. "We must avoid bloodshed, abductions and other forms of violence that characterized the June 2008 elections," they said. They said that Zimbabwe is at a cross-roads; a decisive moment, commonly called Kairos in theological terms, when God's people are faced with making life changing choices as they seek God's guidance. "'Our prayer is that even those who suffered this trauma will still see the value of voting. Our campaign must instil confidence to people who are living in fear because of memories of the last elections." The church leaders expressed concerns regarding attempts to divide churches for political gain, with some faith leaders being forced to attend political meetings. Other fears raised include State-owned media bias, human rights violations, and the increasing difficulty for women and young people trying to vote or engage in the political process. Zimbabwe has a population of 13 million people, but three million of the country's people have fled to neighbouring South Africa. The country was once considered a bread basket, but it now has one of the lowest life expectancy rates in the world. The Christian Science Monitor reported however that Mugabe's ministers, top army, and police chiefs, are believed to be among the richest in the region, due mainly from the sale of diamond deposits in the Marange region. The newspaper reported their holdings include businesses, farms, safari firms, large houses, and cars. An indication of how Mugabe's lieutenants view the prospect of handing over power after an election loss came from his Justice Minister Patrick Chinamasa who said in an interview three months ago the BBC program Hard Talk that the army will wait on their wings to wrestle power from Tsvangirai if he wins. "Now if anyone is going to say, 'When I come into power I'm going to reverse that,' they [the military] have every right to say, 'Please, you are asking for trouble.' You will be asking for trouble." Chinamasa noted during the BBC interview: "He [Tsvangirai] will be asking for trouble [if he] seeks to reverse the land reform program. There is no one who is going to accept any enslavement." Mugabe's support is strongest in rural areas, while Tsvangirai has strong backing in urban areas. Churches have kept a low profile during the current election campaign after some Catholic leaders were critical of ZANU-PF actions during the past two elections. The Zimbabwe Catholic Bishops Conference released a pastor letter on Zimbabwe Elections 2013 entitled The God of Second Chances. The letter said, "In the first 15 years or so of post-independence, Zimbabwe made tremendous strides in almost all spheres of life. It was a country full of promise and indeed the envy of most of the countries in Africa south of the Sahara.
" Yet in 2005, Zimbabwe celebrated its Silver Jubilee of independence under the throes of a crisis, which persists to this day. The patriotic fervor, national pride and the once lofty and romantic ideals of independence seemed to be lost, at least in the considered view of many of our nationals, in the stark reality of a nation divided, traumatized and impoverished by this political, economic and social crisis. "This has manifested itself in the denudation of professionals and skilled personnel through a massive brain drain into the diaspora, . . . decline in agricultural and manufacturing productivity, . . . escalating corruption, flight of foreign investments, . . .declared and undeclared sanctions and dwindling tourist arrivals. "These negative indicators have inflicted a heavy toll on the generality of the population." The bishops said free and fair elections should be possible with a new constitution and "the necessary reforms in place" and that 2013 offers Zimbabwe "a second chance."